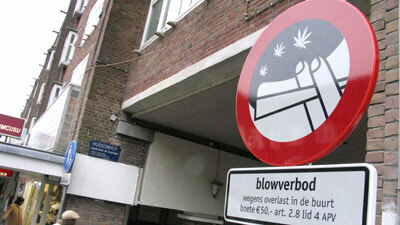 Legal experts in Holland have told Amsterdam authorities to take down signs banning the smoking of marijuana. The city put up the signs establishing “no-toking zones” in an attempt to crack down on pot smoking youth. Now however, the Dutch government’s top legal adviser says that the city had no right to establish the zones as smoking cannabis is already theoretically illegal, although in practice possession of small amounts is tolerated and weed is openly sold in “coffee shops”. The signs, which portray a joint with little cannabis leaves in the background surrounded by a red circle, were stolen so often as collector’s items that the city was forced to open a shop selling them for about $130. The city still intends to issue the fines for toking in those areas, however.